Yesterday, my mother and I went grocery shopping and while we were out, I picked up a couple of bird toys for the chicks. 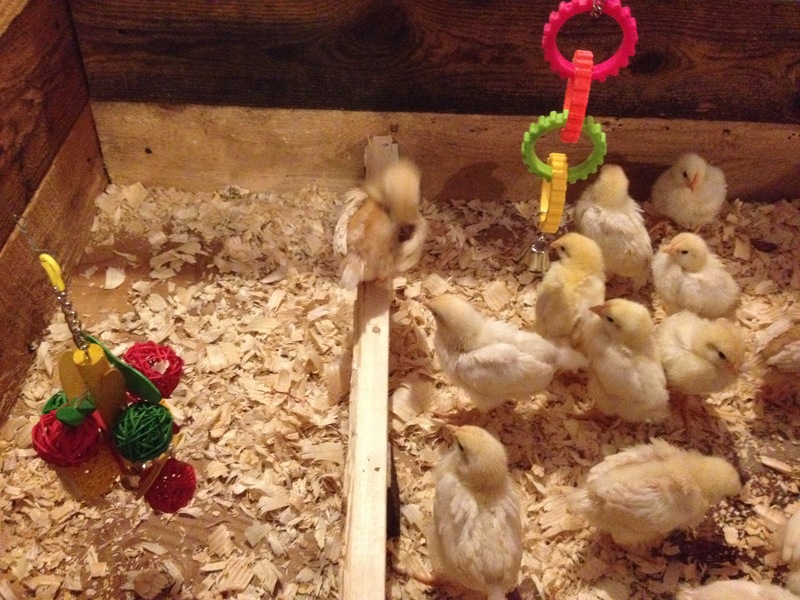 We hung them, and as predicted, the first reaction was ‘omg!whatisthis!’ and a stampede to the other side of the brooder. When I came back later in the afternoon with Little Dude, however, a couple of them had gotten brave enough to approach one of the toys and ring the bell. Then another. It’s fun to watch them being brave and exploring new ideas. Later that night, I showed DH and he basically thought I was spoiling the chicks, but he also decided to ‘fix’ my perch a little bit. So it got a bit of a rehab. “New’ perch and toys, courtesy of DH and myself. They acted like the perch was a barrier and lined up on one side of it to stare at the toy with the balls. At breakfast this morning, they were lined up on one side of the re-designed perch, staring at the other side like it was a barrier they couldn’t cross. Then one of them hopped up on the perch. Then to the other side. A couple others followed suit. Some of the smaller ones can fit under the perch like a limbo pole. A few more rang the bell. It’s cute. They peck the bell, it makes noise and they scurry like crazy to the other side. But at least they’re trying it out. Trying new things. It’s good for them. I tried giving my 3 week old chicks a little bell after seeing yours – I had a cat ball with a bell inside, that my cat doesn’t use. 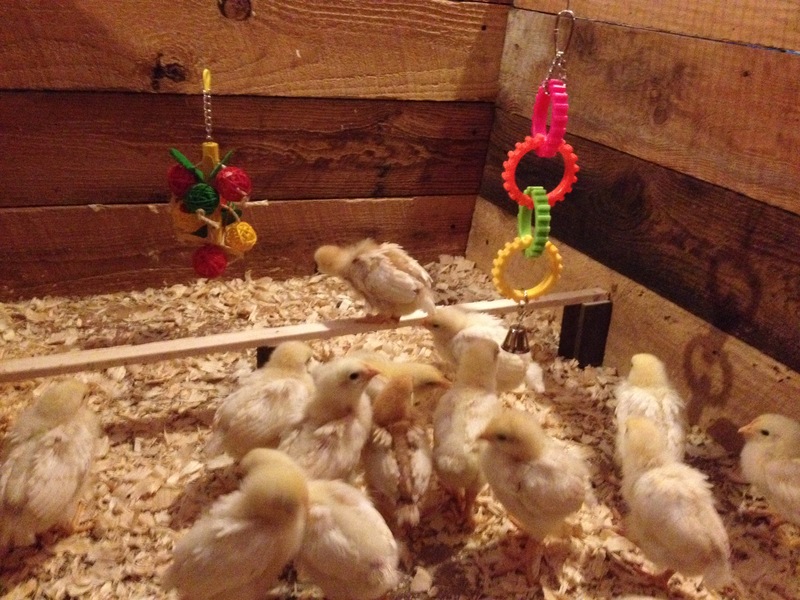 I tied it on a string and hung it into the brooder – they were so freaked out! they wanted absolutely nothing to do with it, they were climbing on top of each other to get away from it. So I took it out for now. I may try it again later, we’ll see. Mine are very skitterish. I have to say, I also tried an unwanted cat ball, but it met with the same reaction and then pointedly ignored. I guess unwanted means unwanted, whether you’re a cat or a bird. I hope your little ones give toys a second chance. My experience is the bells do well, and things wit twine or straw they can peck at. I’m not sure if the colors make any difference, but the difference in textures might.